I don't know if it's fun playing offensive line. It seems like the kind of position that only gets press when they're horrifically blowing out their knees or missing blocks. But I have to imagine that it's rewarding playing in front of Denard Robinson: make your blocks and something awesome might happen on any given play. Regardless of your feelings toward Rich Rodriguez, the one thing he managed to do was put together a solid unit of offensive linemen (sparse though their numbers may be). With the departure of last year's Rimington Award winner (center David Molk) to the NFL and last year's right tackle Mark Huyge (probably Michigan's worst lineman last year and the inspiration of the Spartans In The Backfield tag on this blog), Michigan has a number of holes to fill. Fortunately, the team has just enough experienced linemen to fill those holes, while Hoke and Co. made it priority #1 to recruit the nation's best offensive linemen. Michigan's starters will be good. The backups will be young and probably good. But it's difficult to quantify lineman production. 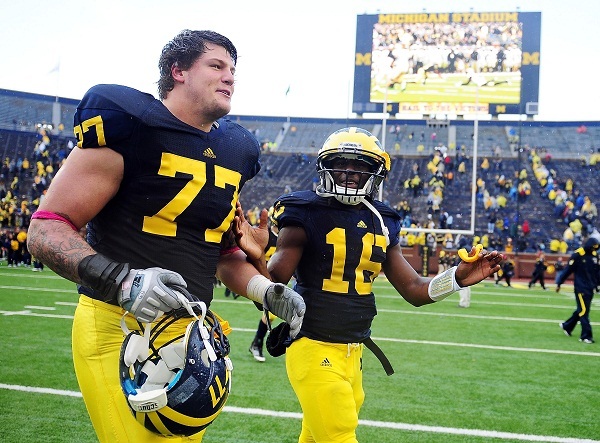 Since showcasing some undisciplined talent in his freshman year punctuated by false starts and holding penalties, Taylor Lewan has turned into the best left tackle in the Big Ten and one of the best in the country. Elliott Mealer will complete his tear-jerker story and take over the left guard position this year if recent camp reports are any indication. Ricky Barnum will look to improve on a shaky Sugar Bowl appearance that saw him chuck a few bad snaps by Denard when Molk went down early steps out from behind Schofield to take over for the departed Molk. Omameh will continue being Omameh: an agile, aggressive run-blocking guard. 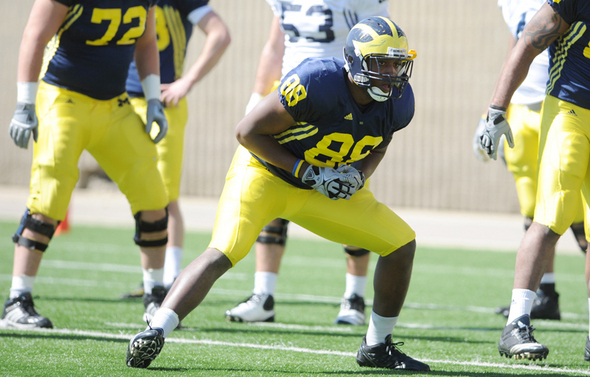 And Schofield will slide over to the right tackle spot after backing up Lewan last year. That's about all that can be said. Despite a few new names, it's hard not to see this as one of the team's strongest units this year barring injury. The team has collectively averaged over 5 yards/carry each of the last two years, which is not something you can do without a stellar offensive line. Expect a few of these guys on the All Big Ten team by the season's end and some national recognition for Lewan, who, begin to pray now won't forego his senior year to enter the NFL early. Yes, four of the offensive line backups are true freshmen. Yes, the rest of the are unheralded recruits without much on-field experience. Yes, I am also terrified. The good news is, most of the true freshmen are highly touted recruits that come in around the field-ready size. Barring an injury to one of Michigan's starting tackles, the team should be able to (relatively) hide any of these guys on the inside. If Lewan or Schofield should go down for any significant time this year, Kyle Kalis will likely be the first off the bench at either tackle position. The rest will pick up time during blowouts early in the year as the coaching staff looks to solidify each position. If you want to know more information on the respective freshmen, visit MGoBlog's recruiting round-ups (linked above). Because Michigan lacks anyone with the combination of size and athleticism that Kevin Koger brought to the team last year, the best bet for nominal starters are Brandon Moore and Ricardo Miller. Moore will spend most of the season as an extra blocker while Miller, at a slight 6'4", 226 lbs (!!! ), will be the kind of flex tight end that is essentially a wide receiver. Before I started writing this, I thought it wouldn't be that big of a deal. I didn't remember Koger catching a whole ton of passes last year, but unfortunately, I was wrong. Only two players (Jeremy Gallon and Junior Hemingway) caught more balls than Koger. In total, the tight ends last year accounted for 23 receptions (235 yards, 5 TDs). The backups are either true freshmen (Williams, Funchess) or position switches. Williams is a battleship: coming in a 6'6", 283 lbs, recruiting sites weren't sure if he was an offensive lineman or a tight end. Williams will play alongside Moore in heavy sets on the goal line. Otherwise, he's on the bench and getting into better shape. Funchess is a highly regarded, Ricardo Miller-esque tight end/WR hybrid. Unless Miller proves unserviceable, Funchess will likely spend the season bulking up on the bench. Jordan Paskorz hasn't seen the field in two seasons on the team. He'll be a non-entity this year. All-in-all, it's going to be touch and go at the tight end position this season. Unless Moore proves to be a more agile route runner and pass catcher, chances we'll see the tight ends used only when the offensive line could use some extra bulk in short-yardage situations. Expect their collective receptions to drop considerably: 15-18 would be a reasonable estimate. Instead, Borges will likely try and spread the field a little more with receivers and open things up for Denard as much as possible. I don't think it was Barnum who filled in for Molk in the Sugar Bowl and had the bad snaps. I think it was Rocko Khoury. Yeah...nice looking starting five but we can't really afford any injuries at all, which is always a disconcerting concept. My prediction is that Kalis takes over for Mealer at LG approximately around the MSU game. Obviously, I hope Mealer can hold him off because he deserves it, but Kalis is just too big and too good not to get some serious playing time right away.